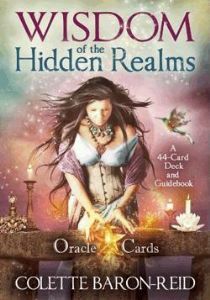 The Wisdom of The Hidden Realms Oracle Cards is Colette’s latest Oracle Card Deck. It was conceived after years of working as an intuitive and being able to see what people needed to help guide them in their moments of need. And thus, the Wisdom of the Hidden Realms was born. This unique and absolutely gorgeous card deck is so easy to use, yet very detailed in its accuracy. Unlike the tarot, which takes years to learn and perfect, there is no learning curve with these cards. It comes with a simple to use guide book that will have you getting answers right from the first card you pick. They are indeed easy to use and filled with valuable information. Each card has two meanings, straight up - the Ally, or reversed – the challenger. The cards themselves use major archetypical characters like the king and queen, but then Colette has developed some interesting archetypes like the Spiral Dancer, The Web Weaver, The Diamond Dreamer, and many more, all based on Colette's 22 years of seeing the personas that dwell in each and every one of us. Thus the meaning of the Hidden Realms. Why settle for advice from friends, family, and even professionals, when the best guidance you can get is a message from spirit. Wisdom of the Hidden Realms is a 'direct line to the divine'.